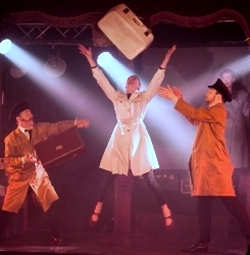 Lost in Transit is back at the Brighton Spiegeltent “with a new twist.” A sell out hit in 2014, creator and director Chris Cresswell gives us an update and shares insights into the creation of a unique piece of cabaret theatre that includes circus and clown. This entry was posted on Tuesday, April 14th, 2015 at 6:46 am and is filed under Audio Interviews, Brighton Fringe 2015. You can follow any responses to this entry through the RSS 2.0 feed. Both comments and pings are currently closed.